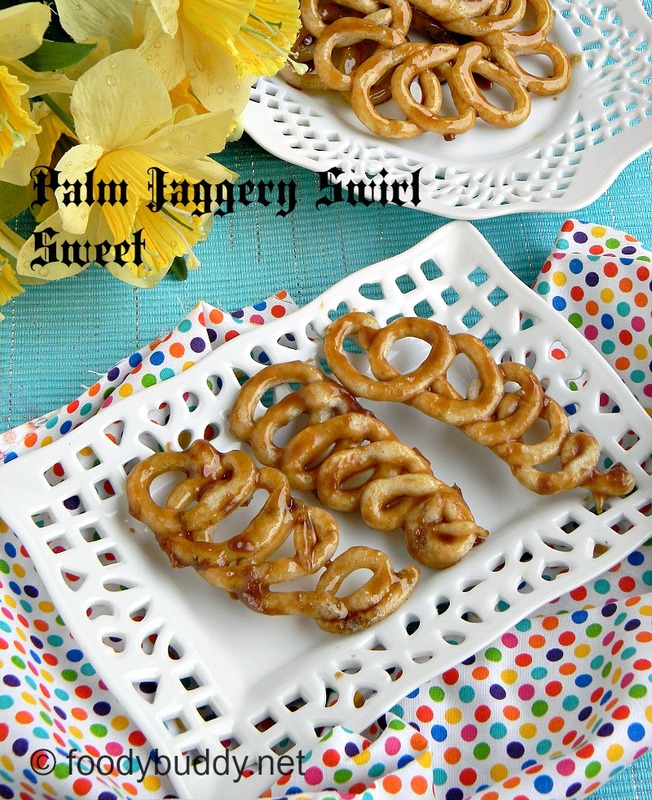 Karupatti mittai recipe / Chenni Mittai recipe / Palm Jaggery Swirl Sweet is an authentic south Indian diwali sweet. This is my father’s favorite recipe. I wanted to post some traditional south Indian sweets so when I was talking to appa (dad) the other day, he gave me 2 recipe ideas, one is karupatti mittai and second one is mundhirikothu recipe which I shared yesterday. Making karupatti mittai is really fun and easy. You can make this sweet with available ingredients like rice and urad dal. For sweetness, you can use karupatti (palm jaggery) or chenni (sugar). One of my American friend Darlene came to our home, she tasted and said it was awesome, she totally loved karupatti mittai. I love both karupatti and chenni mittai. Bored with jangri or jilebi then try this for coming diwali , you will love it and let me know your feedback. Soak both the idly rice and urad dal for overnight. Next day morning, wash both dal and rice, grind it in a grinder for 30 mins by adding very less water until the batter turns soft like that of dosa batter consistency. Grate the karupatti (palm jaggery) with knife. Meanwhile, heat karupatti (palm jaggery) with water, mix it well, until it melted. Filter it to remove impurities. Heat the same pan with filtered palm jaggery, heat it for 6 mins till it turns syrupy. Now add cardamom, salt and dry ginger powder, mix well. Take a ziploc bag, put hole in the center (refer the picture), pour the batter into the bag. 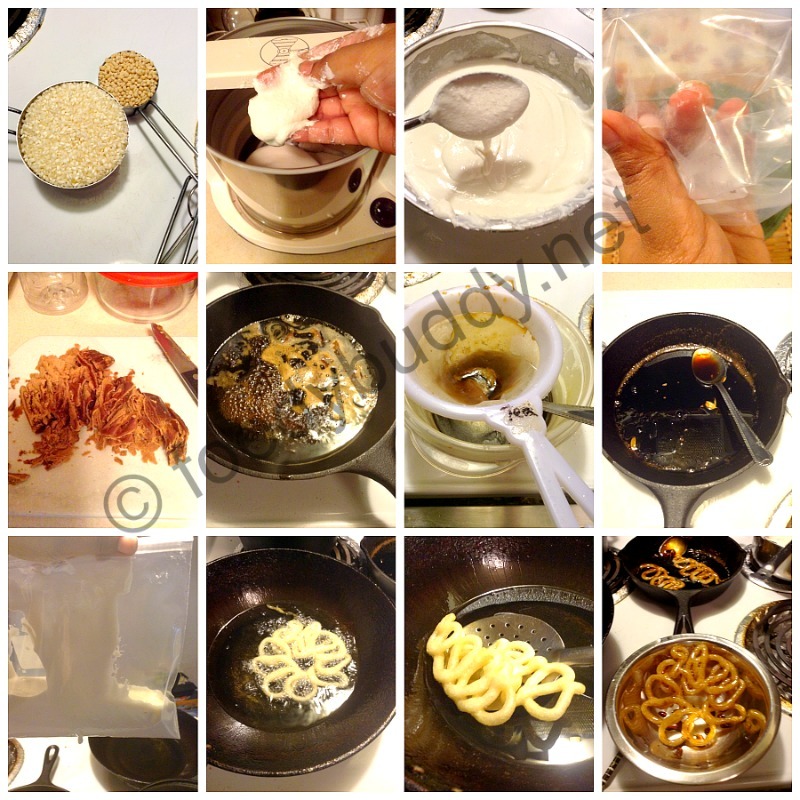 Heat a shallow pan with oil to deep fry, pipe the batter into a hot oil, cook on medium heat until it done. It has to be in pale in colour. Now placed the mittai in warm karupatti syrup for 2 mins until second batch is done. repeat the same process for the rest of the batter. Similarly, heat the sugar with water, filter it and again heat it until turns syrupy. After you cook the mittai, dip it in a sugar syrup for 2 mins. Yum yum karupatti mittai and chenni mittai are ready to enjoy. It tastes great when it is warm. The batter has to be thick . Always add little water while grinding. The batter should be of right consistency like idly dosa batter. Cook in a medium flame. Do not cook for long time it will turn hard and crispy. Do not under cooked you will end up in soggy mittai. Adding dry ginger powder is optional, but if you add gives you a nice taste. Tags: karupatti mittai, karupatti mittai recipe, how to make karupatti mittai recipe, prepare karupatti mittai recipe, chenni mittai recipe, how to make chenni mittai, palm jaggery swirl sweet recipe, easy diwali sweet recipe, kids diwali recipe, healthy diwali recipe. 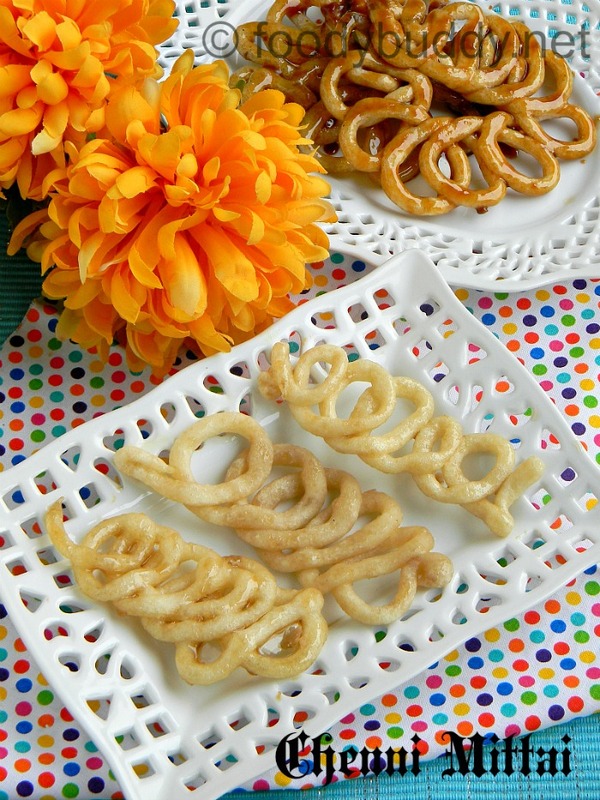 This entry was posted in dessert, diwali and tagged chenni mittai, easy diwali sweet, how to maak ekarupatti mittai, karupatti mittai. Never heard about this gayathri..It sure is a tasty treat.. I have never heard about this one.. But is very interesting.. Am sure it must be delicious as well..
it is a new one to me. looks so Good. appetizing. Looks sooooo divine, bookmarked to try, thanks for sharing!